A few weeks ago, GOforChange visited the Furbish Company headquarters to tour their newly-renovated Lucky’s building, a green office space south of downtown. 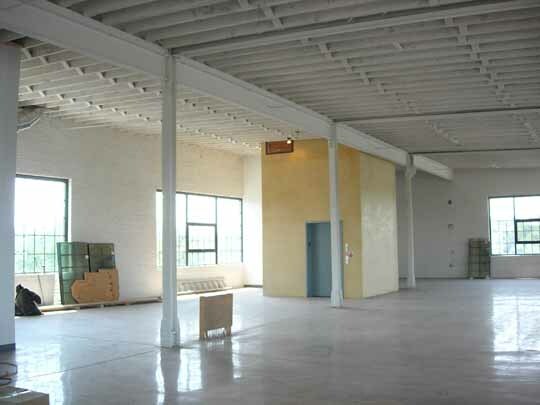 This Brooklyn warehouse was originally used as a wood mill, then became a convenience store warehouse in the late 1970’s. It is now home to several sophisticated systems and practices of ecological design and efficiency. As the developer and owner of Furbish Co., Michael Furbish approached the project by honoring the building’s existing integrity. He added only what was needed to update and enhance the structure’s inherent environmental sustainability. Working with a hydraulic engineer revealed that the building was sitting on 8-feet of water, which quite often would spring up through the floor in the basement. Most people would see this as a problem, but with careful calculation and several hundred feet of tubing, a geothermal system was installed to assist with more than 70% of the building’s cooling needs. Heat for the building is provided by a solar hot water system that transfers heat gain from the sun to a storage cistern that sits on the roof. Support for the cistern comes from a freight elevator that no longer could be used for code reasons. Insulation for the cistern is provided by AAC (Autoclave Aerated Concrete) walls. The AAC distributor has its offices on the first floor of the Lucky’s building. The building isn’t fully occupied and is looking for tenants. Additional plans for Furbish’s own office space are in the works, including workstations that use salvaged doors from Second Chance. The entrance to the building is complete with an earthen wall and Furbish has plans to install vegetative biofilter walls to filter rainwater runoff.